Kohli and his wife with Federer. Image - @imVkohli/Twitter. 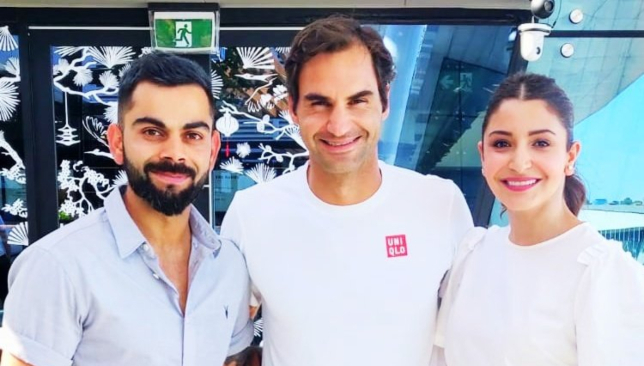 Following India’s ODI series clinching victory in Melbourne, skipper Virat Kohli took the opportunity to meet tennis ace Roger Federer on the sidelines of the Australian Open. Accompanied by his wife Anushka Sharma, Kohli met the 20-time Grand Slam winner at Melbourne on Saturday. The Swiss tennis icon has already booked his place in the round of 16 of the first Grand Slam of 2019 where he will face Greece’s Stefanos Tsitsipas on Sunday. The Swiss great is bidding to defend the crown he won 12 months ago by defeating Rafael Nadal in the final. Enjoy a day off on Saturday, Federer met Kohli and his wife after hitting the practice courts in the morning. The trio looked chatted warmly before posing for a series of pictures. Following their meeting with Federer, Kohli and Anushka sat in the VIP section of the Rod Laver Arena to watch Serbia star Novak Djokovic take on Denis Shapovalov. On Friday, Kohli and his men had notched up a seven-wicket win in the third and final ODI at Melbourne to clinch the three-match series 2-1. The win rounded off an excellent tour of Australia for India in which they had attained their maiden Test series victory Down Under. Tim Paine and Virat Kohli had a lot to say to each other in Perth. Australian veteran coach Dav Whatmore insists India captain Virat Kohli does not need to change his behavior in any way and added that the skipper and his players are being criticised unnecessarily. 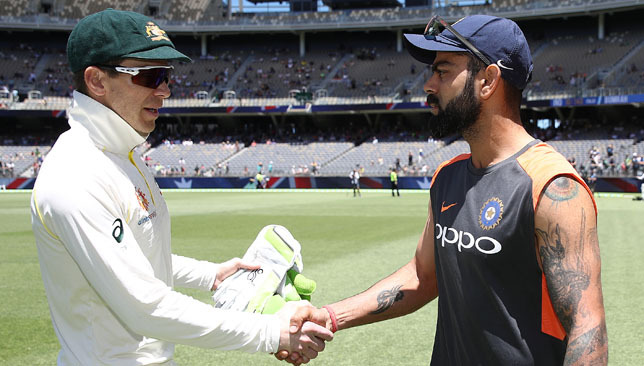 India lost a feisty Perth Test to Australia with captain Kohli and his counterpart Tim Paine embroiled in numerous verbal clashes. The Indian skipper has been criticised for his behavior and his confrontational approach to the game. But Whatmore, who was in Dubai to oversee a special winter training camp by Kricket’s Spero, said what happened in the Perth Test was within permissible limits and Kohli shouldn’t change the approach that has brought him and India so much success. Former Australia Test cricketer Whatmore, who has coached various teams like Sri Lanka and Pakistan with distinction, believes Kohli does not need to behave any differently. Whatmore, who is currently coaching the Kerala state Ranji Trophy team in India, said it was harsh to suggest India need to have a relook at their leadership group if they fail to succeed in the remaining Tests. Former captain Sunil Gavaskar has said that the Indian management led by Kohli and coach Ravi Shastri made selection blunders in South Africa, England and now in Australia and that the board needs to see if the team is benefiting from their leadership group. Many cricket experts and fans believe India made a mistake by going in with four fast bowlers in the Perth Test following injury to off-spinner Ravi Ashwin and think someone like a Ravindra Jadeja would have offered more reliable spin and batting depth than pacer Umesh Yadav. But Whatmore does not think it was that big a mistake. “India went with four fast bowlers instead of three and one spinner. Kohli is getting it from the Indian press from all quarters. I don’t think it was that much of a mistake. Jadeja is a different spinner to (Nathan) Lyon. We will never know. Maybe it would have helped their batting but you wouldn’t pick a spinner for his batting. I don’t think they deserve the criticism that they have been getting,” the 64-year-old added. Kohli hasn't managed to master Test chases this year. Heading into India‘s overseas slate of South Africa, England, and Australia, a stretch of tours that began with the New Year’s Test in South Africa in January, and culminates at the end of the ongoing series in Australia, all eyes were, as always, on Virat Kohli. His record in away Tests, and especially in England, was under scrutiny. Over the past year, however, he’s conquered all conditions – as a batsman, at least. But as a captain and match-winner, the numbers make for grim reading. 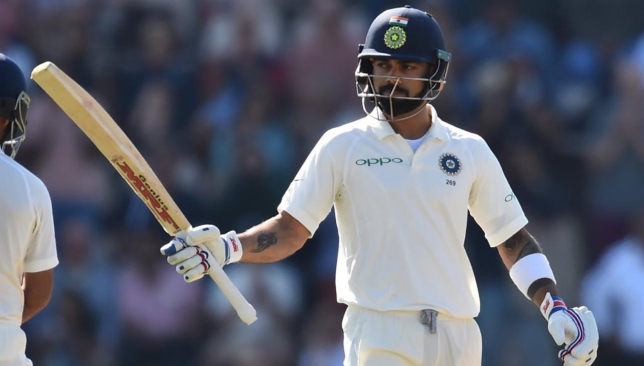 Kohli has managed four centuries in 10 Tests across these three tours, but only one – against England at Trent Bridge – has come in a winning cause, with the other three all ending in India losses. He’s made 11 in 27 overseas Tests overall against South Africa, England, New Zealand, and Australia (SENA), but only one, that 103 at Trent Bridge this year, has come in a win. And Kohli, the master of a chase in limited-overs cricket, hasn’t been able to translate that skill into Tests this year. He averages just 26.40 in six fourth-innings chases across these three tours, with no 100s and two 50s. That’s a far cry from his overall fourth-innings average against these four countries overseas, which is a respectable 47.84. India’s batsmen in general have been poor at chases in Tests across their last three away series. Rishabh Pant and KL Rahul are the only ones to have fourth-innings centuries, with both hitting the three-figure mark at the Oval in September. Largely on the back of that knock of 114, Pant has India’s highest overseas fourth-innings average this year, at 54, and Rahul’s average of 33.20 is also almost entirely down to that Oval century, which accounted for 149 of his 166 overseas fourth-innings runs in 2018. Ajinkya Rahane is the only other batsman to have averaged 30 or more, coming in at exactly 30, but with just one fifty. While Kohli would be disappointed with his own record, the most shocking statistic belongs to Cheteshwar Pujara. India’s current No 3 is often compared to Rahul Dravid, his predecessor in the position. Dravid’s fourth-innings in away Tests for India against SENA countries was 44.42. This year, Pujara has averaged 6.4.